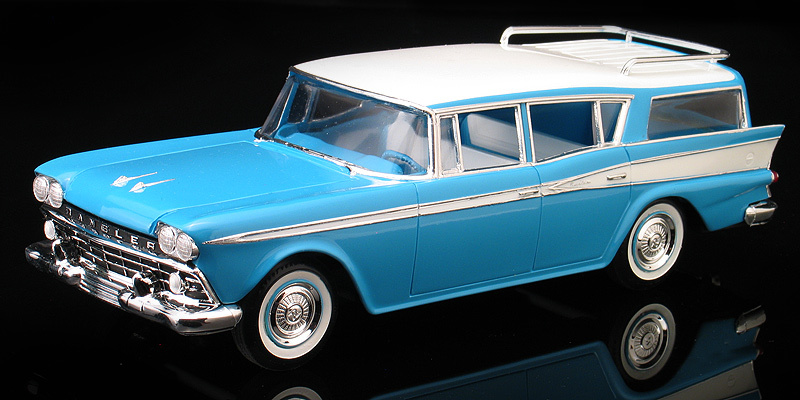 I built this 1/25th scale 1959 Rambler Cross Country station wagon for a job that never panned out. 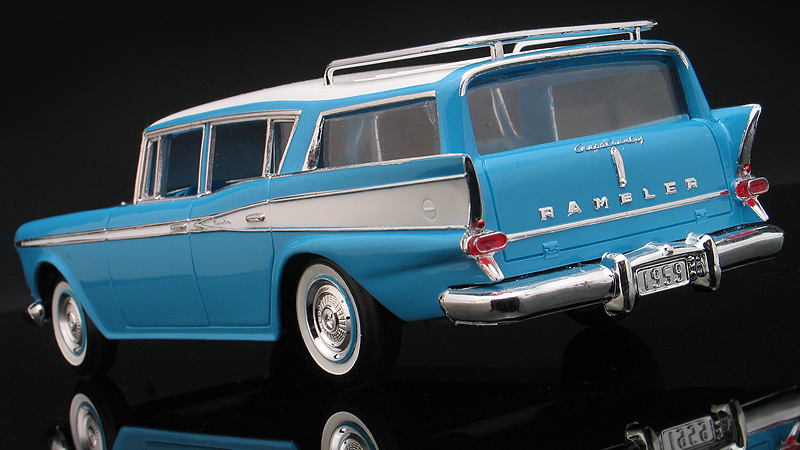 I was contracted in 2009 to do box art for a re-issue of the old Johan Rambler wagon kit. There's a complicated story of how this tooling fell out of Johan's control but the simple version is that the tooling changed hands several times and ended up with Ernie Petit who was starting a new model company named Illinois Model Company (IMC). I was sent a test shot of the kit and I discovered the tail lights and police dome light parts were missing. Ernie told me that this tooling was missing and was being redone. I went ahead and designed artwork for the box and decals. Well, about a year went by without much word about the kit and then the new parts for the tail lights finally showed up. I was told to finish up the art and prepare it for final delivery to the printer. A few months later Ernie showed my Rambler box art along with box art for several other ex-Johan kits including the Chrysler Turbine Car and a '75 Olds Cutlass at the I-Hobby Show in Chicago. I also know of several other ex-Johan kits that were yet to be announced. At that point it looked like everything was going well and the Rambler would see the shelves again soon. But, it was not to be. After another 10 months without much word, I enquired about the status of the project and Ernie told me he was having trouble getting a licensing agreement with Chrysler (who now owns the rights to all AMC products also.) He was told they did not want to add any new vendors at that time. I'm speculating here but this was about the time when Chrysler was in the midst of re-organizing under Fiat management and there could have been any number of reasons why they didn't want to give him licensing. Whatever the case, it was the death blow for IMC as many of their other ex-Johan kits waiting in the wings were Chrysler products as well. Ernie, frustrated after spending time and money on the venture, decided to throw in the towel. The tooling for this kit is still out there though, all freshened up, with new box and decal art, ready to be put into production. Perhaps, it will see the shelves again some day. I built this model to photograph for the box art. My model was built straight out of the box. 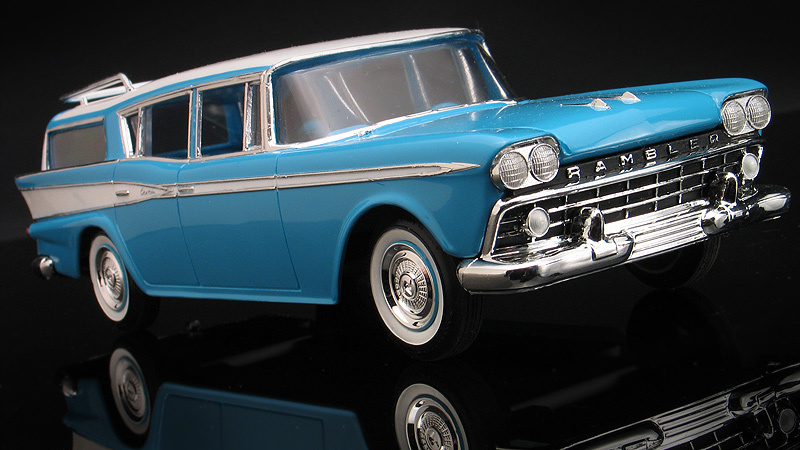 It's a simple promo-style kit with a one-piece molded chassis, but the body is nicely proportioned. One really nice feature about this re-issue was to be the clear windows. Previous issues had the window unit molded with an odd dark green tint. That makes my built test shot example with clear windows extremely rare.